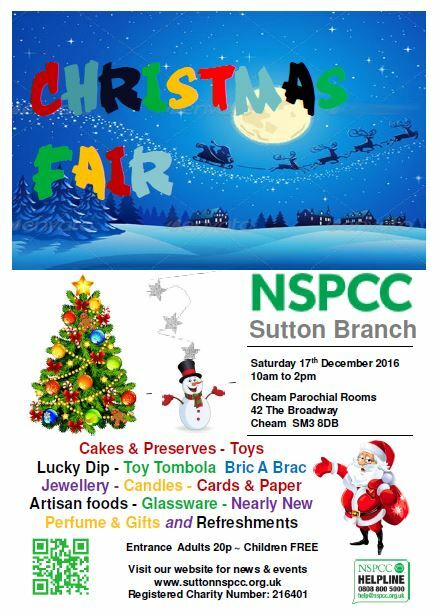 This is advance notice of the Sutton NSPCC Branch Christmas Fair on Saturday 17th December from 10am. The local branch will be holding its Christmas Fair at The Parochial Rooms, The Broadway Cheam. We are happy to promote this event – The Liam Charity Presents – The Special One Cup – family fun day. Come down and join us on Saturday 4th June at Carshalton Athletic FC for the Special One Cup – family fun day in support of the NSPCC’s ChildLine service! This year we celebrate five years of hosting this fantastic event and to help us honour this, we have invited Princess Elsa from Frozen to help with the festivities and will have football legends Kerry Dixon and Perry Groves supporting our four teams as they battle it out for the prestigious title! As usual we have an array of great activities for all the family taking place, including live music from the wonderful Claire Rapson, enchanting dance performances from Destiny’s Stage School and Xpression Dance, inflatables, face painting and a delicious BBQ to enjoy. We will also be holding our annual raffle and we have some amazing prizes this year which include a children’s bike and helmet and Afternoon Tea at Windsor Hotel. Tickets can be purchased on the door and £5 for an adult, £3 for young people (12-16) and free for children under 12. The gates will open from midday and the match will begin at 12.30pm. 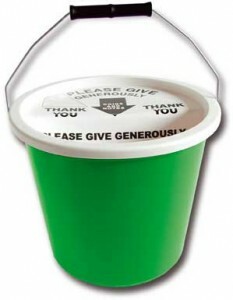 Each and every penny donated on the day will go towards the NSPCC’s ChildLine service – a free and confidential helpline for children and young people. 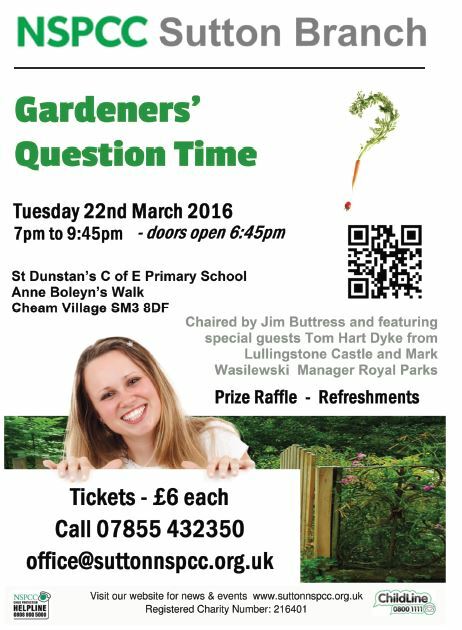 Our ever popular Gardeners’ Question Time 2016 will soon be upon us – Tuesday 22nd March 2016 – see details below. Tickets are now available at £6.00 each. There will be refreshments and a prize raffle. Our expert panel is chaired by Jim Buttress from BBC2’s The Big Allotment Challenge, with special guests Tom Hart Dyke from Lullingston Castle and Mark Wasilewski, Manager Royal Parks. With Mother’s Day fast approaching we thought this would be a fun way for the Mums, Nans, Sisters, and Aunties of your children to support the NSPCC! How would you look if your children did your make-up? We’d love to know! Why not let your little ones make you look beautiful and support the NSPCC at the same time. Let them work their magic, then post your selfie on Facebook for your friends and family to see. Every Childhood is worth fighting for, have fun with your children raising money for the NSPCC and support vulnerable children in the UK.